Since three days we're busy conducting Instructor Specialty Training with Ivo and Elliott. 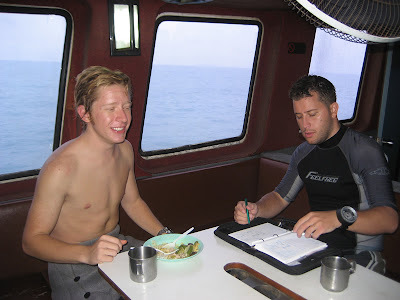 Two days ago we started at Chaweng Beach with the Navigation Specialty which we conducted in low visibility, which actually benefits this specialty and really puts extra demands on your navigational skills. Yesterday we conducted two Search & Recovery training dives to complete this Instructor specialty at Japanese Garden around Koh Nangyuan, near to Koh Tao. 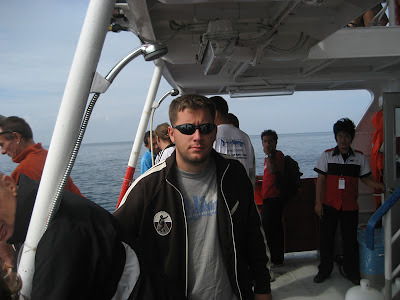 Here's Ivo at board of the Seatran ferry, on the way to Koh Tao today, where we conducted a Deep dive (one out of two) and a Naturalist dive for the respective Instructor ratings. 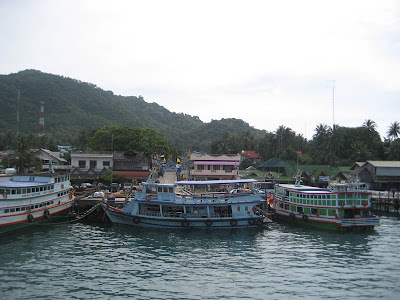 Here's a view on Koh Tao's main pier at Haad Rin. 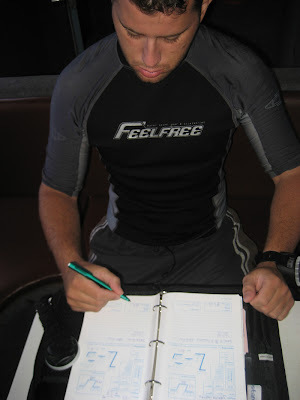 We conduct the majority of this set of Instructor Specialty Training around the various Koh Tao dive sites. Ivo logging his dive, during the lunch break. Tomorrow we'll be conducting another Deep dive and Elliott will conduct a Dry Suit dive. Elliott and Ivo during lunch. Unfortunately there are no underwater pix this time around since visibility is down to a maximum of 3 to 5 meters, due to the rainy season raging in full strength (see my Samui weather blog for daily updates) only top side pix. The DSAT Gasblender Instructor course is still in the pipeline for Stuart and Ivo and the DAN provider course for Elliott and the DAN Instructor course for Ivo. I will report later on these courses.